세조 3년(1457) 8월에 세조가 전라도 능성에 있는 쌍봉사에 잡역을 면하고 토지와 노비를 내리는 것을 명하는 교지로, “감사와 수령은 전에 내린 전지(傳旨)에 의거하여 쌍봉사를 잘 살펴 보호하고 잡역을 감면하라”는 내용이 담겨있다. 이 교지는 총 7행에 걸쳐 해서체로 쓰여졌는데, 예천용문사 교지(보물 제729호)와 형식이 동일하고 다만 대상지명, 절의 이름, 발급된 날짜만 다를 뿐이다. 조선 전기에 왕이 직접 내린 문서로 당시 사패교지의 형식을 알 수 있는 중요한 문서이며, 또한 세조임금의 사찰보호 및 불교귀의에 관한 의지를 엿볼 수 있는 자료이다. 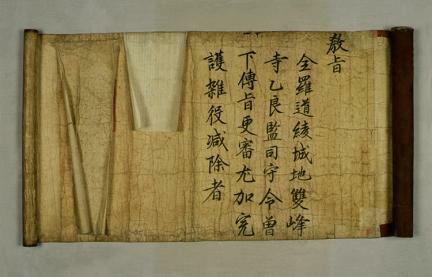 This document is a royal edict issued by King Sejo of the Joseon Dynasty in the eighth lunar month of 1457 (third year of King Sejo’s reign). It exempted Ssangbongsa Temple from labor duties and endowed it with land and servants. It states that the provincial governor and the local magistrate should protect the temple and exempt it from miscellaneous labor services according to the previous orders. The seven lines of the edict are written in regular script style, and its form is similar to the Royal Edict of Labor Exemption Issued to Yongmunsa Temple in Yecheon (Treasure No. 729). These two royal edicts differ only in the name of the region, name of the temple, and issuance date. 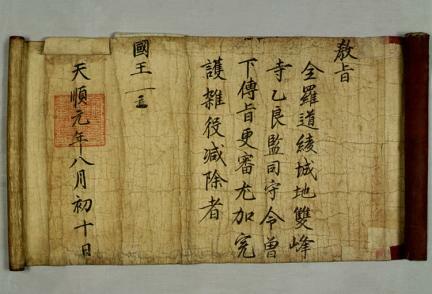 This document clearly shows the form of the royal edict of labor exemption issued in the early Joseon Period. It also signifies King Sejo’s will to protect temples and promote Buddhism.